Titan is the largest of the 53 moons that orbit Saturn; in fact, it is the second largest moon in our solar system (only Jupiter’s Ganymede surpasses it). This means that Titan is much bigger than our own Moon, and even the planet Mercury. But, despite being one of the most sizable moons in our solar system, Titan has a rather weak gravitational pull (a person who weighs 100 pounds on Earth will only weigh 12 pounds on Titan. ie. Titan is a great place for jumping and, thus, basketball). But I’m afraid that this interesting moon is rather inhospitable. Still yet, if you decide you want to build your own spaceship, or something to that effect, and travel to this far-away, exotic world… there are several things we should tell you first. (After all, the most important aspect of survival is preparation) Like…. Titan’s average surface temperature is a chilly -289 degrees Fahrenheit (-178 degrees Celsius), which is a little cold even for the hardiest Earthlings. 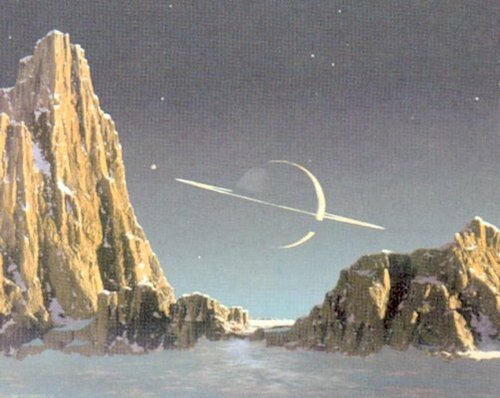 Yet, you shouldn’t let the temperature keep you from visiting this magnificent rock, because Titan is the only moon in the solar system known to have clouds and a thick planet-like atmosphere. (Several others have very thin atmospheres) And I mean “thick.” Titan’s atmospheric pressure is about 60 percent greater than the Earth’s, so walking on Titan will be roughly the same as walking on the bottom of a swimming pool. Except that you won’t get a ton of water up your nose. Like Earth, Titan’s cloudy atmosphere is mostly nitrogen, but it seems to contain much higher percentages of “smoggy” chemicals (like ethane). This smog gathers into such large concentrations that it rains gasoline-like liquids. I know what you’re thinking, “A moon that has gasoline-like rain? 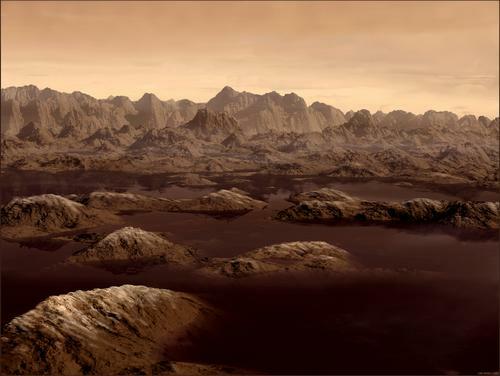 This makes Titan sound like a huge candle just waiting to be lit, and it hardly sounds like a suitable vacation spot.” But fear not. Combustion requires oxygen, so as long as you’re super careful with your oxygen tanks (emphasis on the “super”), you’ll be just fine. However, on the off chance that there is a fire, DO NOT try and put it out with water. Why? I’ll give you a hint: in H2O the “O” stands for “oxygen”. 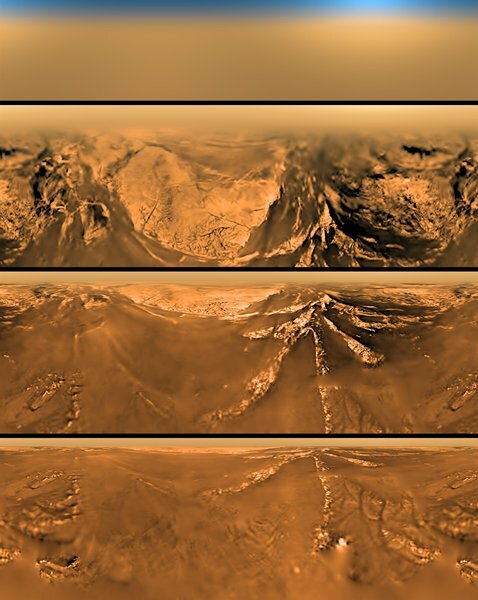 And it seems that there might be quite a lot of this gasoline-like rain on Titan. Radar images from the Cassini spacecraft revealed a land of lakes in Titan’s northern hemisphere; these lakes are about the size of North America’s Great Lakes. But in case you’re thinking about having a refreshing drink from a Titanian spring, I should probably mention that most of this liquid is likely methane (which changes from a gas to a liquid at -117F/ -83C). And it seems that the methane has been quite busy, because Cassini also detected canyon-like structures on the surface of the moon. But white-water rafting through these canyons might be a bit difficult…because the lakes are “methane” and not “water” (obviously). But white-methane rafting will be difficult as well, because the density of liquid methane is only about half the density of water. As a result, paddlers will have a hard time churning the methane enough to propel the craft when needed. Similarly, if you want to go swimming on Titan, you may have a bit of a problem; you’ll probably need to have a special apparatus in order to fling enough of the thin fluid to move yourself. It has also been imagined that this slightly less dense fluid, coupled with Titan’s much lower gravity, will enable you to push yourself about half way out of the water, kind of like a dolphin. Best of all? Since you are lighter and the air is denser, with large artificial wings, it might be possible to take off and fly. To further revel in the awesomeness of Titan, check out our article, Get to Know Titan: 6 Interesting Things to Know About Saturn’s Largest – and Most Awesome – Moon. When (or More Importantly, How) Will We Evolve?